I am hoping to get a bunch of loropetalum that I will plant along my fence in the sun. 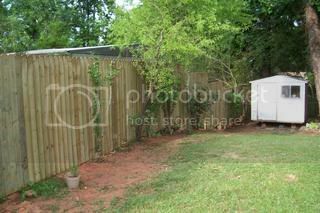 (see pics below) There are 4 rose of sharon, 3 roses and a golden plum, along that same fence, and I'm wondering if I should completley remove them all (not the plum) and make a nice full row of Loropetalum, or intermingle the loropetalum with the roses and rose of sharon. I have attrached alot more animals to my yard as well. At first I liked the thougth of Chipmunks and rabbits, but they eat the tops off all my flowers and dig them out for their own purpose. We also have some big frogs, they seem to be harmless. I have thought about putting in a water feature. Any ideas about the Chipmunks and Rabbits? * I hate to try and get rid of them but I don't want to constantly come outside and see my caladiums and flowers chewed up. More pictures after I get my loropetalum. *Write back about my above questions. 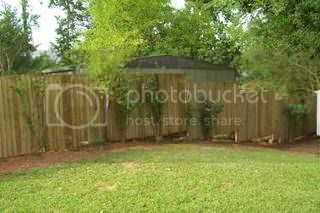 Your ideas are great and a trellis with a climbing, flowering vine would set the shrubs off nicely. Good luck with your project. Looking good. Looks good, you have done a lot of work. I would intermingling them with the rose and Rose of Sharon if you can. Or at the very least move the Roses and Rose of Sharon to other parts of the garden. We don't have Chipmunks down here but we have Squirrels. I have never had troubles with them eating my plants, except for one I caught dragging a baby Sempervivum tectorum out of the flower bed and across the yard. Most of my plants grew with individual chicken wire fences around them for a few years until the last of the wild rabbits went into some neighbors stew pot. We have an oppossum that digs little divots in the yard looking for grubs and bugs at nights but he is doing me a favor. That fence looks very tempting! You've got sound advice already, so I'm looking forward to seeing what the result will be. I'm a very bad garden planner, I'm afraid. That fence looks great and that band of soil right in front of it will make a very nice border. My goodness graceous me...wouldn't I lurve to have that to make pretty. I'd be thrilled. Anywat, it is obvious that you have done alot and things are starting to fall into place. Congrats on all that you have done. Looking foreward to more fotos once you have your plants. We do not have ground squirrels here...but we do have rabbits. In fact, if I were a betting man, I'd bet that it was the rabbits that were doing all the eating. I had to fence off anything that I did not want them eating...which does not look so good. About the only other thing that you could do is to trap them oooor get a dog, which might dig-up your flowers. Rabbits are an irritating problem, I sympathize with you.